That brings the total number of supported SMS Gateways to over 70. If there are any SMS Gateways that you would like us to support please contact us and let us know the details – we can usually add a new SMS Gateway in a few hours. 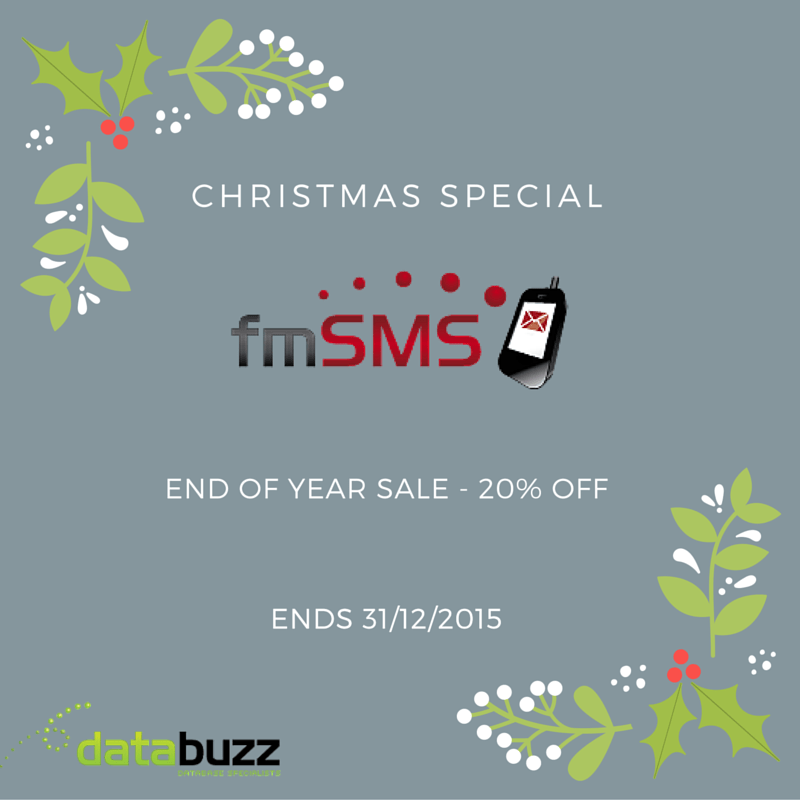 It’s time for the fmSMS End of Year Xmas Sale – All fmSMS Licenses are now 20% Off. The sale runs until the end of the day on the 31st December, 2015 (Australian Eastern Daylight Time). All our prices are in Australian dollars – if you’re purchasing from outside of Australia you’ll also get to take advantage of the low Australia dollar (1 Australian Dollar equals approximately 0.72 US Dollars). That brings the total number of supported SMS Gateways to over 60. If there are any SMS Gateways that you would like us to support please contact us and let us know the details – we can usually add a new SMS Gateway in a few hours. On December 1st, 2015 Twilio will be updating api.twilio.com with a SHA2-signed certificate – a significant improvement in encryption technology which most online services are in the process of implementing. We’ve done some tests using fmSMS v3 and are pleased to report that fmSMS is already compatible with the updated Twilio endpoint when it goes live later this year – no further action is required. We will run some further tests on December 1st, 2015 when the changes go live – if you encounter any issues please contact us. Databuzz will once again be demonstrating at the annual FileMaker Developer Conference this week in in Las Vegas, Nevada. To celebrate we will be offering a DevCon show special for the entire week – all versions of fmSMS will be discounted by 10%. You can purchase fmSMS from the fmSMS online shop. If you’re attending the conference please stop by our booth and say hello and we can demonstrate fmSMS in person. You can find a list of all the videos on our fmSMS Videos page. We’ve also embedded the videos where appropriate in each of the Getting Started Guide pages. There’s an interesting article on the Xero blog about using SMS marketing to drive revenue – How to increase sales on a budget. The article illustrates how an Auckland hair salon came invested $45 on an SMS marketing campaign to their existing customers to promote another one of their services that generated $24,000 in short-term revenue and up to $451,955 in long-term revenue. This demonstrates an effective and appropriate use of SMS marketing to your existing customers – something fmSMS integrated with your FileMaker solution was designed to do. Telstra have recently opened up the SMS API Preview to all developers and it’s still free, subject to the same original limitations. We’ve released an updated version of fmSMS with support for the Telstra SMS API so you can take advantage of the free messaging to Australia numbers during the preview. You can download a trial version of fmSMS to test the Telstra SMS API Download Trial Version. We’re pleased to report that fmSMS v3 is compatible with FileMaker Pro/Pro Advanced v14 that was released today. We haven’t encountered any issues so far in our testing and have been able to send single and bulk messages successfully. If you encounter any issues with fmSMS v3 and FileMaker Pro v14 please let us know. We’re excited to announce that we will once again be exhibiting at the 2015 FileMaker Developer Conference where we will be showcasing fmSMS v3, our 2 way SMS solution for FileMaker Pro, FileMaker Go and FileMaker Server. FileMaker Inc. have recently released the schedule for the 20th anniversary edition of the FileMaker Developer Conference (DevCon) to be held in Las Vegas, Nevada from July 20-23, 2015.
fmSMS allows you to send an SMS from FileMaker Pro, FileMaker Go and FileMaker Server to almost any mobile phone in the world, reaching over 800 networks in more than 200 countries. fmSMS v3 was completely rewritten from the ground up for FileMaker Pro v12, and with the release of FileMaker Pro v13 we’ve also added support for some of the great new v13 features including Perform Script on Server and FileMaker WebDirect. If you’re coming to the conference please stop by and say hello and we can demonstrate how you can send and receive SMS/TXT messages using FileMaker Pro, FileMaker Go and FileMaker Server. We hope to see as many of you there as possible and look forward to answering your questions about FileMaker and SMS integration.